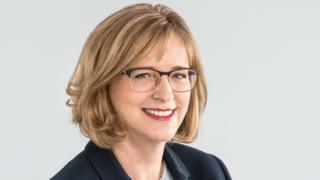 Image caption Hiltrud Werner grew up in East Germany, where "more than 90% of the women worked"
As the lone woman on Volkswagen's management board, she is a rarity in the upper echelons of German industry. Ms Werner's first appearance in front of an all-male board was less than a decade ago - at a firm she declines to name - and it was a memorable one. "I got a very nice email that said: 'Please Hiltrud, wear trousers, they are not used to skirts in the boardroom,'" she recalls with a playful grin. "Of course, I came in a pink dress." The 52-year-old joined Volkswagen's board in February 2017, at one of the most turbulent moments in the carmaker's history. As head of integrity, she was charged with putting VW's house in order, and reforming a corporate culture which turned a blind eye to the widespread cheating of diesel-emissions tests. In the German press, she is often portrayed as a matron-like figure, hired to clean up a mess made by men who should have known better. It is a characterisation she dislikes - noting that women are among those charged in the various "Dieselgate" investigations. Ms Werner says she considered it an "honour" to be asked to oversee VW's turnaround, but she is under no illusions about the scale of the task. To date, the diesel emissions scandal has cost Volkswagen roughly €28bn, ($31bn; £24bn) and her prediction is that 2019 will be the firm's "most difficult year" ever. The pressure on her is not just internal. Her efforts are being closely scrutinised by the court-appointed monitor Larry Thompson, a former US Attorney General who worked on the prosecutions of Enron executives, and whose task it is to evaluate whether the group's ethics programmes are robust enough to prevent further criminal activity. Since Ms Werner's interview for this piece, the company has faced further negative headlines. Its chief executive, Herbert Diess, apologised for evoking a Nazi slogan, while American regulators filed suit against VW, claiming it misled investors in the run-up to Dieselgate. "We are still busy with the root cause analysis," Ms Werner explains. The origins of the Dieselgate scandal, she maintains, are "complex" but that VW felt it was "too big to fail" and there was not enough self reflection, employees thought what they did "in the context of the company, was good". To try to remedy that, Ms Werner and her team have rewritten the job specifications for more than 2,000 people, "to make sure that roles and responsibilities are clear and that everyone understands what their obligations are". But she is not content with challenging the culture of one of Germany's largest companies, and has her sights set on transforming her compatriots' attitudes to women in power. That task may prove to be even more daunting: Germany, as she points out, was one of last developed economies to get an anti-discrimination law, in 2006. At the time of writing, not a single one of German's top 30 firms has a female chief executive. Many of Ms Werner's fellow corporate leaders do not grasp the scale of Germany's problem. When touring other companies' offices, she says, executives sometime say: "Oh you know what, we did really well, we've got a woman on the board." When she appears in public in Germany calling for equal pay and equal opportunities, "people think I'm the chief human resources officer", she says. In other words, they don't see her cause as being central to a company's overall governance. The lack of progress within German business is in stark contrast to the country's political arena. Angela Merkel is in her 14th year as chancellor. Her most likely successor, Annegret Kramp-Karrenbauer, is a woman, as is Andrea Nahles, who leads their coalition partners, the SPD. Hiltrud Werner and Angela Merkel have something in common - both were brought up in East Germany, a country, Ms Werner points out, in which "more than 90% of the women worked". "She has been seen as very gender neutral," says Ms Werner, adding that Mrs Merkel is "always wearing trousers - boring outfits, you could say". Ms Werner makes an effort to do the opposite: "I don't want to be a woman dressed like a man, I often intentionally come in colourful dresses." Not having children has also helped Mrs Merkel overcome German prejudices. "She has never been seen as a working mother that left her kids at home," says Ms Werner. "She did not experience all the struggles that other women in leading positions feel. "That's why we have such a long way still to go in Germany, because the role model is just half a role model." Not that Ms Werner is immune to the pressure felt by women in the workplace to please their male peers. At the start of her 28-year career in the car industry, she confesses, she was just "looking for a survival strategy" and taught herself to speak "the language of men" in an attempt to blend in. She learned that "if you are asked what car you are driving, and you answer 'a red one' then that is wrong". Instead she would show colleagues pictures of her particular model - highlighting its engine power and how exhilarating she found it to drive on alpine roads. This adjustment was a part of "making sure everyone understands that you love the product," she says. As VW goes about repairing its reputation, Ms Werner wants the firm's hundreds of thousands of employees to hear the same message: that she has the car industry's best interests at heart. "I have a lot of fuel in my blood," she says, pausing to acknowledge Volkswagen's next big bet. "Maybe in future I will have to say I have some electricity in my blood."